Your card to scoring great seats! The Grand Rapids Symphony Symphony Scorecard program allows members to receive up to four (4) FREE tickets for selected Grand Rapids Symphony performances. Launched in September 2015 with support from the Daniel and Pamella DeVos Foundation, Symphony Scorecard, which has just completed its fourth season, has provided over 11,000 tickets to music lovers from across West Michigan. Members of our community receiving financial assistance from the State of Michigan and active, reserve or guard military households. How can I get a Symphony Scorecard? 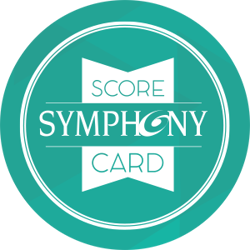 Symphony Scorecards are available from area Social Workers and partnering organizations. Click HERE to see a list of current Symphony Scorecard Partner Agencies and Organizations. What Concerts Can I Attend? Come to as many Grand Rapids Symphony concerts as you like! For a complete listing of concert programs and performance dates and times, please visit our concert pages. To order tickets, Symphony Scorecard holders must contact the Grand Rapids Symphony ticket office no later than Friday at 5 pm in advance of the concert. Call 616.454.9451 x 4 to reserve tickets. At the Concert: Tickets will be held at Will Call at the concert beginning approximately 2 hours before the concert start time. In Advance: Tickets will be held at the Grand Rapids Symphony ticket office (M-F: 9 am - 5 pm) - 300 Ottawa Ave NW, Suite 100, Grand Rapids, MI 49503. *Symphony Scorecard is not available for Gerber SymphonicBoom concerts, Special Events, or weekday performances of the Lollipop concerts. Additional restrictions may apply. Availability is subject to change without notice. Tickets available while supplies last. Seat location will be determined by the Grand Rapids Symphony. Symphony Scorecard may not be used in combination with other offers. Support provided by the Daniel and Pamella DeVos Foundation, Tony Betten & Sons Ford, Fountain Street Church Social Action Committee, and Fishbeck, Thompson, Carr & Huber. Transportation support provided by The Rapid.